CM Magazine:Lord of the Sky. Linda Zeman-Spaleny. Illustrated by Ludmila Zeman. Indians of North America-Folklore-Juvenile literature. Reviewed from Uncorrected First Pages. At the age of 12, Linda Zeman-Spaleny immigrated to Canada with her parents from the Czech Republic. In the front matter of the picturebook, Lord of the Sky, she describes her amazement at first seeing totem poles in British Columbia. Zeman-Spaleny's parents wanted children around the world to know that These glorious carved columns tell stories in wooden pictures. 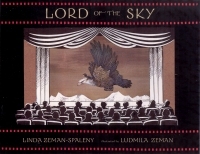 So in 1991, Ludmila Zeman and Eugen Spaleny wrote and directed the short animated film called Lord of the Sky. 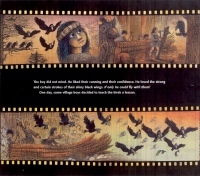 The picturebook, Lord of the Sky, is based on this film. The cover of the picturebook (I reviewed this book from an unbound, uncorrected advance copy) communicates the cinematic origin of the story. An audience is depicted viewing a movie, and Zeman situates viewers of the image at the back of a theatre. On the screen, framed with drawn curtains and centered in the illustration, is projected an image of Thunderbird/Lord of the Sky in flight. An Aboriginal boy, the child who seeks out Lord of the Sky to restore the sun to the village, rides atop the majestic bird as it sails over the mountains. Zeman makes further reference to the film origin of the story by including two rows of red perforations along both the top and bottom of the image on the cover. The story begins on the verso (left) endpage with both illustration and text. Long, long ago, nothing lived. Nothing could be seen. On the recto endpage, Zeman depicts the Great Raven bringing Sun to the coast of the North Pacific. Further illustrations on the front matter pages show images of contemporary Vancouver and totem poles along the ocean shore. According to legend, a young West Coast Aboriginal boy admired and befriended the ravens. However, these black-feathered creatures were not always well mannered, and one day some village members decided to teach the ravens a lesson for their misbehaviour. A group of boys began throwing stones at the birds, but when none were successful in striking their targets, the boys changed weapons. Before the boy could stop his peers, an arrow pierced the heart of a raven. Deadly silence ensued; rustling black wings filled the sky and the land became dark. The wise elder explained to his people: The raven is our brother. Without sun, there can be no life! The only creature that could help the village was Lord of the Sky, but none of the men were willing to seek out his assistance. The boy slipped away from his village, launched his canoe onto the sea and began his journey to find Lord of the Sky. Exhausted from paddling, the boy fell asleep, and when he awoke, he discovered that his canoe had been tossed onto a rocky shore. He heard the chirping of a young bird, and although his action was dangerous, he climbed a rocky tower to return the fledgling to its nest. Just as he reached his destination, an enormous bird landed on the nest and spoke to him. Even though the humans had behaved foolishly, the gigantic spirit bird agreed to help the boy because he had demonstrated courage and kindness. The boy rode upon the back of Lord of the Sky, and the giant bird used his powers to return sunlight to the village. Although the parable transports readers to a time long ago, Zeman-Spanley connects the story's environmental message to our contemporary world by reminding readers at the end of the book that, as in the past, our world needs to be cared for. The final illustration features a group of contemporary children admiring a young bird. The children, who are in the centre of the illustration, are framed by totem poles on each side and by a city image in the background. The didactic ending may affect some readers' enjoyment of the picturebook, but, considering current environmental issues such as global climate change, Zeman-Spanley's ecological message deserves repeating. Zeman's artistic media include pencil, coloured pencil and watercolours on paper. Various warm and earth-toned colours are used effectively at the beginning of the book to depict aspects of the landscape, the people's clothing and the presence of the sun. She skillfully changes the lighting in the illustrations to communicate meaning. The colour black is used extensively in Zeman's artwork – at times communicating the unknown, such as when the world was beginning, and at other times, communicating fear, such as when the land becomes dark following the death of the raven. The black is highly saturated, which further symbolizes intensity and strength. Black is used extensively in the overall layout of the book as well. The artwork is framed by black borders both at the top and at the bottom of each page. However, each illustration, itself, is bordered by perforations, again communicating the film origin of the story. The layout of the book varies – some pages have one illustration and the white font text is placed below the illustration. Other pages have two horizontal images with the text printed between the two perforated images, and one page has no text. The colours of the perforations vary throughout the book, and each colour change is symbolic. For example, when the sun is shining, the perforations are light yellow, communicating warmth and sunlight, but when the raven is killed, the perforations become vibrant red, communicating blood, anger and danger at this point in the story. However, red is used again to colour the perforations at the end of the story, this time communicating something different to readers. Other symbolic details in the illustrations include the image of the sun being transformed to a skull when the ravens punish the humans for their actions. The beautifully rendered artwork is a visual delight and deserves careful viewing – I have discussed only a few aspects in this review, but readers are encouraged to further consider Zeman's use of colour, as well as line, space and perspective. Ludmila Zeman has authored and illustrated other books including the Gligamesh and Sinbad trilogies, and The First Red Maple Leaf. Sylvia Pantaleo is a language arts professor in the Faculty of Education at the University of Victoria in Victoria, BC.